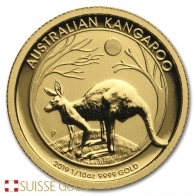 2019 Australian Kangaroo 1/4 oz 24k Gold .9999 Fine! 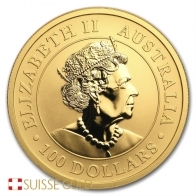 Each coin has a face value of $25 AUD, and contains 9999 fine investment grade gold bullion. The front of each coin features the image of Queen Elizabeth II on the front, with an image of a Kangaroo on the reverse. The image each year of the Kangaroo is updated. On the 2017 version, the Kangaroo is hopping across the ground. 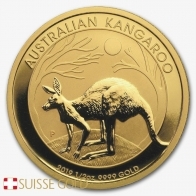 The Kangaroo gold coin is produced in a number of sizes, from 1/20 oz up to 1 tonne, however the most popular sizes are 1/10 oz, 1/4 oz, 1/2 oz and 1 oz sizes. In 2016 the Perth Mint also started producing the Kangaroo coin in silver. The Perth Mint also produce the Lunar Series of coins in gold and silver, which feature a different animal image from the Chinese calendar each year. 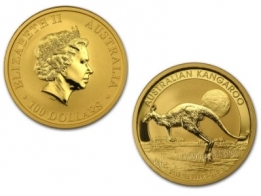 Please contact us to sell gold Perth Mint Kangaroo coins.